Christmas tree permits for Routt National Forest are $10 each. Christmas tree permits are available at the following locations. Forest Service offices are not open on the weekend. STEAMBOAT SPRINGS — Don your snowshoes, grab a saw and fill up your thermos. Permits to cut down Christmas trees in Routt National Forest are available now for $10 from the U.S. Forest Service. “It’s a good way to explore the county and find some different national forest accesses off of paved roads,” said Steamboat resident Walter Magill, a 15-year veteran Christmas tree hunter. He said snacks and something warm to drink makes the experience more fun. A way to securely tie off your tree will keep your adventure from ending in tragedy. 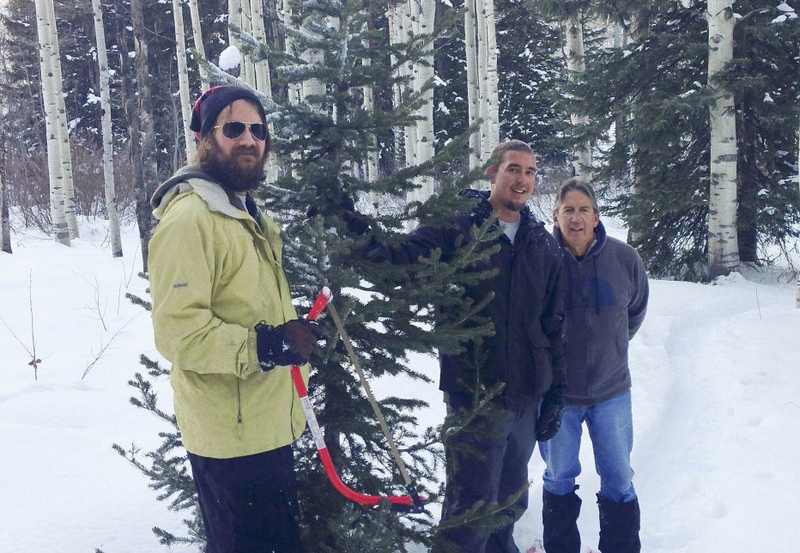 “Everyone wants the perfect little Christmas tree that’s all symmetrical on all sides growing out all by itself — just very picturesque,” said Izzy Padilla, who works in visitor information services for the Hahns Peak/Bears Ears Ranger District of the Routt National Forest. Padilla explained that cutting trees from a clump reduces competition for those trees and enables the remaining trees to access more nutrients and grow stronger. You should dig out your tree to cut it as low to the ground as possible, though it can be difficult with several inches of snow on the ground, she said. The right tree might require some compromise, Magill said. When choosing where to go, Padilla recommends avoiding the east summit of Rabbit Ears Pass, which is a hot spot for tree hunters. Far fewer people make it over to the west summit, she said. Magill said there are good trees around Greenville Mine Road and the Ferndale Trail in North Routt. For Steamboat residents, he recommends making a day trip of it by venturing down to Toponas Pass on Colorado Highway 134 and eating lunch in Oak Creek or Yampa. Fourth graders with an Every Kid in a Park pass can receive a free Christmas tree permit from a Forest Service District office. For more information on the Every Kid in a Park initiative, visit everykidinapark.gov. Some areas of Routt National Forest are off limits to tree cutting or may be difficult to access. Contact a Ranger District in the area where you will be cutting your tree for site-specific information, including road status and area restrictions. Cutting trees in the Flat Tops, Sarvis Creek and Mount Zirkel wilderness areas is prohibited. Tree hunting is also prohibited at Fish Creek Falls, Steamboat Ski Area, Freeman Recreation Area and Sherman Youth Camp. There are additional restrictions in place in the Bear River Corridor. The threat of falling trees continues to increase; therefore, the Forest Service reminds all forest visitors to pay attention to weather forecasts, avoid areas with beetle-killed trees on high wind days, be aware of surroundings and check maps to avoid getting lost. Weather conditions can change quickly, so be prepared. Dress for winter conditions and have your vehicle equipped adequately. Some regulations to remember when cutting a tree include the following. Trees may not be cut within 100 feet of roads or within 200 feet of campgrounds, picnic areas, scenic pullouts, administrative sites, timber sale areas or designated wilderness areas. Distances may be greater for state highways and scenic byways, so contact district offices for details. Visitors are encouraged to choose a tree that is growing with other trees in a cluster and not choose the “perfect” tree that stands alone. The forest environment benefits by thinning the clusters and allowing the strong trees to remain and provide for a healthy genetic source for the future forest. Maximum tree height is 20 feet. Maximum tree diameter is six inches at the stump. Cut the tree to a stump height of six inches or less, or below the lowest living branch, whichever is lower. If one living branch is left on the stump, the tree will continue to grow, although it will probably become deformed and encourage disease. If boughs are wanted, please choose a taller tree than needed (maximum 20 feet) and use the lower branches for boughs. Please do not cut boughs from other living trees.